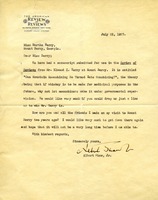 Ms. Berry has received flowers from Mr. and Mrs. Nabers and sends them a letter of appreciation. 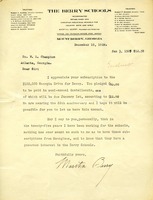 Constance B. Holt writes Martha Berry to donate $300 to keep a brother and sister at Mount Berry for the coming year. 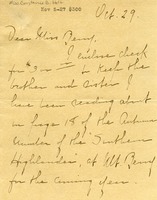 She has read about the siblings' plight in the autumn edition of the Southern Highlander and wishes that, if the brother and sister are already provided for, her donation will give two others in need one year at Berry. 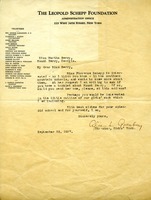 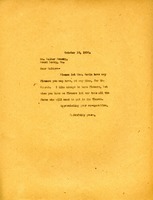 Ms. Alice L. Grandbury is writing Miss Martha Berry in regards to a Mount Berry booklet for a student interested in attending. 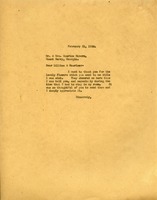 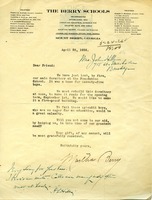 This is a letter to Martha Berry from Mrs. John Hills in response to a plea for donations. 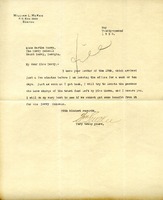 Mrs. Hills encloses a check for $15 and explains that she can only send a "mite" because "calls are many and often." 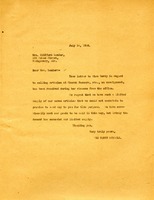 The letter acknowledges Mrs. Spencer's gift of $5.00 to the schools.